Lea Thompson: (Uncertainly) Hello, this is Lea Thompson…? BE: Hey, this is Will Harris! How are you? LT: (Laughs) I am pretty dang good. BE: Well, excellent. It’s a pleasure to talk to you. LT: Nice to talk to you too. BE: Well, I have to admit that I went into “Exit Speed” a little skeptical, but it played like a good old fashioned 70’s drive-in movie. LT: Isn’t it funny? I know, I know. Me, too. BE: So how did you find your way into that project? LT: Yeah, a little bit of profanity, too, I guess. I just liked the character. It’s actually a great character. That’s how I choose them. And it ended up being a brutal shoot. Like, a horrible shoot. BE: Oh, really? Where did you film? LT: We were in Dallas. It was a weird period of time in Dallas where it rained every single day, so we were stuck in that mud, and it was…well, it was horrible. BE: One thing that made me laugh about the film was the fact that is seemed like Fred Ward spent 90% of the film driving. LT: I know. Isn’t that awesome? BE: Definitely. They just kept cutting back to him, and there he is, furrowing his brow as he continues to drive. LT: He’s hilarious. He’s great. That was really another attraction; I really liked him. BE: So, as a rule, how do you pick your projects these days? The ones outside of Hallmark, I mean. Between the “Jane Doe” franchise and the various movies, they must keep you hopping in and of itself. On "Exit Speed":"I had been doing a lot of action movies on The Hallmark Channel, which have no blood. So I was really interested in spending some time with some real blood." LT: Well, actually, I’m not making those anymore, but, you know, it’s usually just the part. Or something like that. Tomorrow, I’m doing a sketch comedy show here in L.A., and that’s a whole other thing. You know, something I have never done before. I just like to keep moving, and if you just wait for the big projects to come around, you might wait a really long time. So I did a couple of musicals this fall. I did a musical with Jason Alexander here in L.A., called “I Love My Wife,” and I’m developing a couple of movies to direct. You know, it’s the story of America right now: you’ve got to diversify and keep trying new things. BE: Actually, I just talked to Patrick Warburton, and he was talking about “Rock Slyde,” which I see you’re also in. BE: I saw “Senior Skip Day” awhile back. BE: Now, that seemed like that was a lot of fun, you getting to play the mom in a teen comedy. LT: You know, that was one day, too! (Laughs) A friend of mine was, like, “Come play for one day,” and you just do it. Actually, I thought it was kind of cute when I saw that movie. Yeah, that’s what it’s like now; it’s a very different business than it used to be. You know, everybody’s doing a lot of different things just because of the nature of things going straight to DVD and there are web things and live things. You know what I mean? It use to be so compartmentalized, like, you either did musicals or you did comedy. Everybody kind of has to try everything now. It’s a different business than when I first started. 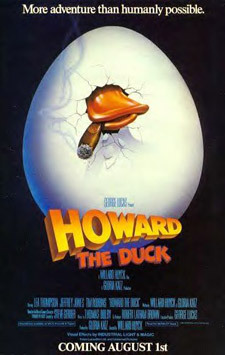 BE: Well, I actually had a Lea Thompson marathon last night, because I got my copy of “Howard the Duck” on DVD as well. BE: I am not. They reissued it, and it’s got this featurette where you contributed an interview. LT: Right, I mean, I knew it was coming out, but I didn’t know it was actually hot off the presses. BE: I’m not sure if it’s actually in stores yet. I’d have to check that, because I got an advance screener. But I saved it until I was watching “Exit Speed,” too. LT: You know, my big hope for that “Howard the Duck” thing was that they were going to put the rock video on there, but I don’t think that they did. BE: They did not…although, actually, I just linked to it on my Facebook page. They’ve got it on YouTube. LT: (Shocked) They have the rock video on YouTube? BE: Yeah, they do. I think somebody has actually transferred it from VHS or something, because it’s not a great quality, but at least I got to see it. LT: Oh, man, I don’t even have a copy of it. LT: And it is so cool. You know what else is really obscure that I have? I think it’s the 17-inch dance mix of “Howard the Duck.” It’s kind of outrageous. LT: I love him. What a great guy. BE: So what was that movie like? I mean, obviously, you worked hard on it. but then it came out and everyone was making use of the “Howard lays an egg” joke. BE: Yeah, I would think that would get a little weird at that stage. LT: “You in bed with a duck is just pretty much a deal breaker, mom.” (Laughs) So they have never seen it past that. It’s a crazy crap shoot. It’s a crazy business that I have survived in now for…whatever, 30 years. But it’s funny: I think “Howard the Duck,” the second season of “Caroline in the City,” “Exit Speed,” and a new “Back to the Future” set are all coming out right no. BE: Yeah, I was going to bring up that “Back to the Future” just got reissued for the umpteenth time. BE: So “Some Kind of Wonderful” put you into the John Hughes oeuvre. BE: Is it weird to know that you were in so many movies that made guys swoon? Every guy I knew had a crush on you…and I’m including myself in that number. LT: Aw, that’s so sweet! I love that. Well, actually, what was kind of nice was, in “Back to the Future,” to be the subversive girl next door. “Back to the Future” is really subversive, you know? She’s a really bizarre character where I’m, like, super in heat over my son. So on face value, it was like the girl next door, but it was really the twisted girl next door. I’m proud of that…and proud of my work. A lot of kind of iconic…you know, people I think are really cool ended up liking me, even liking me in “Howard the Duck,” because it was such a crazy character and such a crazy idea. So I’m really happy that I have that legacy, so to speak. Joaquin Phoenix in it! And now he looks older than me, and he was, like, ten when I worked with him. He was such a sweet kid. He’s such a nice guy. I can’t believe they made fun of him on the Oscars. That’s so mean! BE: To be fair, he did set himself up for it a little bit. LT: You’re right, you’re right. It’s a little like my other co-star, Crispin Glover. BE: (Laughs) Now, what was he like to work with? He looks relatively normal in “Back to the Future,” but then you’ve got “River’s Edge,” which was from that period of time, too. LT: No, he’s remarkably strange…but in a fantastic way. I think he’s immensely talented and, in a way, it’s a little sad that kind of all that eccentricity probably got a little bit in the way of him getting the kind of parts he deserves, because he is so good. You know, it’s too bad when that happens. I probably have the opposite thing happen to me, that my normalcy has gotten in the way of me getting really good parts sometimes. (Sighs) I should have been a little more eccentric. BE: What would you say is your favorite project that you worked on that didn’t get the love that you thought it deserved? LT: Oh, gee, that’s interesting. Well, I did Sally Bowles on Broadway, “Cabaret,” Sam Mendes’ version, and I was like the third or fourth one to do it, maybe the fifth one to do it, so I never got reviewed…and I was really good! So that was upsetting to me a little bit, although I still got to do it, which was fantastic. But…gee, that’s hard to say. You know, I was watching the first season of “Caroline in the City,” and it was super duper. I mean it was really funny. So I think maybe that show…since it was pretty much critically hated! "Back to the Future' is really subversive, you know? She’s a really bizarre character where I’m, like, super in heat over my son. So on face value, it was like the girl next door, but it was really the twisted girl next door." LT: You know what I think? I think it’s because I was at the center of it. I think my essence is pretty nice, and that it wasn’t quite twisted enough or something. It was like it was too nice for people. But I think that show was undeservedly criticized. You know, another problem was that we weren’t an underdog. We got the best time slot in the history of TV! But when I watch that show, it’s really solid, and it’s really, really funny. Probably by the last year it wasn’t quite as solid, because they took away my writers, but I think that show was given a little bit of flak…but people loved it. I won all these People’s Choice Awards, and we won stuff, so people loved it. And it had really good ratings. Anyway, that would probably be what I would say was a little brutalized. But I’ve had a few of those in my time. You know, nowadays with the internet, it’s an equal opportunity brutal playing field. I mean, everyone is brutal to everybody half the time. Well, not half the time, but you know what I mean. People can be unbelievably brutal on the internet, about everything. But they can also be really, really nice. The problem is that human beings like to focus on the negative sometimes, unfortunately. BE: Well, the upside is that the people who are usually the most brutal are the ones that can barely string two words together. If you can’t trust their punctuation, you probably can’t trust their opinions. LT: Well, you must know. You know exactly what I’m talking about. LT: I’m, like, how did that happen? How did I get inserted as an insult in someone else’s review? Anyway, it’s not for the faint of heart. BE: How can someone not like an interview with you? A minute ago, you used the word “super-duper” in a completely non-ironic way. That’s awesome! LT: (Laughs) Yeah, well, I think we’re dealing with so much information in this time that we’re all trying to peg each other really quickly, and human beings aren’t that way. We’re lots of different things, you know what I mean? BE: Okay, last one, because I want to try and keep you close to on schedule anyway. LT: Well, you’re so nice. It’s really nice to talk to you. BE: (Blushing) Well, I just wanted to ask you about “Article 99.” I really enjoyed that movie, and the cast was…well, you look at it now and it’s just incredible who was in that movie. BE: On top of everyone who was already a name at the time, you have John McGinley, who went on to “Scrubs,” and John Mahoney, who went on to “Frasier” and so forth and so on. What was it like working on that movie? It was kind of a sprawling ensemble. 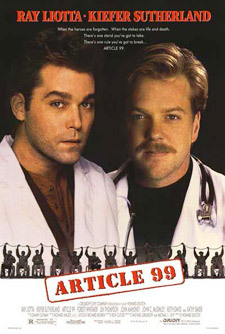 LT: Forest Whittaker and Kiefer Sutherland, too. I mean, it just went on and on. And it was really interesting because I was eight months pregnant. LT: And my husband (Howard Deutsch) was directing the movie. LT: I know. And they had actually hired somebody else to play my part, but she didn’t work out, so at the last minute, they were, like, “Your wife’s already there in Kansas City, so have her do the movie.” But I was eight months pregnant, which you can’t really see. I’m a little bit puffy in the face, but…it was a little bit awkward trying to do, like, a slightly romantic scene with Kiefer Sutherland when I was eight months pregnant with the director’s kid. (Laughs) But, yeah, Ray Liotta was there, too…it was kind of a macho fest, with all those boys. Imagine them all on location together…and I couldn’t party with them! I kind of missed a lot of the really good times. That was really an unsung movie; I’m fascinated that you’ve even seen it. BE: Yeah, I remember seeing it when it first came out on VHS, to date myself, but I remember it fondly. LT: Well, yeah, and when all this V.A. stuff was going on, it’s very topical, you know, that whole taking care of the vets. It’s very, very topical. It’s a shame that movie didn’t come out now; it would draw attention to the plight of the vets in the hospitals, because we’re going to have a lot more of them to deal with. It’s a really important issue. I wish I had all those videos that you have of my stuff. They won’t even give me a video of “Exit Speed”! BE: …but surely if you ask, they would come through for you. LT: I know. I said, “I’m doing all these interviews, they should give me the videos!” But I’m glad you got a kick out of the movie. It is surprisingly entertaining. BE: It was. Like I said, my expectations were…well, you never know when things premiere on video. But it was a lot of fun. I enjoyed it. LT: Oh, good, I’m glad. You’re so kind. LT: I know! Isn’t he a good director? LT: I have yet to see it, but I know there’s a reference to our movie, “Some Kind of Wonderful,” in some big movie right now. Oh, it’s “He’s Just Not into You.” I’m not in it, but I think they mention Amanda Jones. BE: Well, still, your legacy lives on either way.